When it comes to kitchen renovations, a backsplash is one of those elements that too often get overlooked. Maybe that’s because many kitchen remodelers don’t fully understand the importance of it, past aesthetics alone. Or, maybe it’s due to the fact that they tend to look at them as just another unnecessary expense – something for the “wants, not needs” list. Either way, it’s time to give kitchen backsplashes the recognition they deserve. 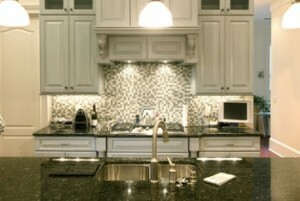 If you are asking the question “do I need a backsplash?” – the answer is yes. Well, I mean you don’t have to have one, but there are many reasons why a backsplash is a positive influence on your kitchen remodel. If you don’t put in a backsplash, you’re essentially saying you’re okay with having cooking grease and all sorts of other food splatter on the drywall behind the stove. Maybe that doesn’t bother you, but keep in mind that over time this will lead to deterioration. Backsplashes protect walls and are typically made from durable, easy to clean materials such as tile, stone or glass. Don’t forget about the area behind the sink with all those splashes and water stains. There is typically a gap between where the lip of the counter top edge meets the wall, just large enough for the water to trickle down and turn into mold and mildew. Sure, you can try to caulk it – but occasionally that gap is just too large. And even if caulking is your answer to the mold and mildew, who wants those watermarks ruining your beautiful wall or paint job? Adding a backsplash also opens up a world of options for incorporating a decorative element. Think of your backsplash as an extension of your design style, there are so many different materials and colors to choose from. According to the NKBA’s Top Kitchen and Bath Trends for 2012, Glass backsplashes are on the rise and being used by more than half of kitchen designers – up to 52%. If you enjoy “green” kitchen remodel options, a recycled glass backsplash is definitely a good way to stay eco-friendly, as well as stylish. The NKBA trends report also shows ceramic tile has led the way for years, but is slowly on the decline, sitting with 74% of designers, and natural stone holding steady at 60%. If you are worried that installing a backsplash is a little more permanent than you would like, rest assured. Compared to many other items involved in your kitchen remodel, this is usually the easier and less expensive of your replaceable options. So go bold…and if you have a personality transformation in the years to come, your backsplash can too.